Based in Bangkok, Thailand we are an international designer fashion agency, supplier and distribution business. We work closely with many leading fashion houses to bring you the latest fashons from the finest designers in Thailand. We supply wholesale fashion clothing & accessories globally including the UK & USA. Having a permanent base in this major Asian city means that we know our suppliers personally and can ensure you get the latest quality fashions at realistic prices. 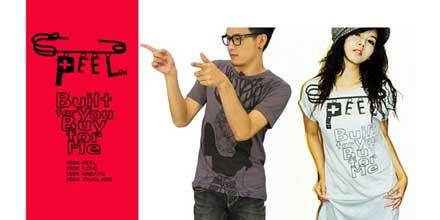 We represent some of the fastest growing and most commercially successful fashion lines from Bangkok. Our labels already have a strong international growth record and their relationship with us helps them to further raise their profile. We have made exclusive partnerships with these great fashion brands old and new. We only work with smaller independent design houses which offer an amazing range of affordable yet high quality fashion. Our portfolio includes ladieswear, menswear, shoes, accessories and jewelry. We work with leading independent fashion boutiques internationally. We want to work with you and build a trusting relationship. We are flexible and through communication find a way that works best for both of us. Initially, please take a look at a selection of our suppliers below - You can browse their Facebook pages or website, the links are shown under their promotion. Also, take a look at the Platinum Fashion Mall directory, there are thousands of additional wholesale fashion and accessory brands featured. You should then let us know which suppliers are of particular interest and which of their products you wish to order, along with quantities, timescales and delivery location - We will then obtain the prices. The prices shown on their pages is usually retail, so please ignore them or just use them as a guide. 1. What are the agent fees? - This is negotiable depending on your requirements and how much work we need to do. 2. Is there a minimum order quantity? - No, but higher quantities will ensure a lower unit price. 3. Are samples available? - Yes, you may purchase samples which we will post to you by air mail. 4. How do you ship? - Small quantities will be shipped by air, EMS service - Larger quantities can be shipped by land/sea. 5. What are the shipping charges? - Please see the Thailand Post website for shipping charges. There is an option to select English. 6. How long does shipping take? - EMS takes 3-5 days - Land/sea takes 2-4 weeks. 7. What is the buying process? - All sample and small orders will need to be paid for up-front. You can pay by credit/debit card or Paypal. For larger orders payment is negotiable negotiable, but typically a 50% up-front payment is required. 8. What about import duty and VAT? - We are not responsible for this. You may be charged duty at the local rate in your country upon delivery. You need to take this into condiseration. sample orders are unlikely to attract duty. 9. How do we get started? - We need to know your particular requirements in detail - Start by looking at our suppliers websites and let us know what you need. Thong Yoy have a reputation for creating fabulous feminine fashions to suit all occasions, paying particular attention to detail producing exquisite, beautifully made garments. Always 22 have a big range of fashion clothing aimed at the twenty to thirty somethings. This beautifully made range of ladies fashion is amazing. Dress Me Crazy offers a great collection of wearable, practical yet feminine women's clothing. Somewhat young and K-Pop, but we believe this will be a big style for 2015! Neerada carefully manufactures beautiful feminine clothing for women. Her particular area of interest is feminine florals & lace fabrics. Zenne is an established Thai fashion label which designes and creates beautiful young ladies fashion clothing for the nicer occasions in life. 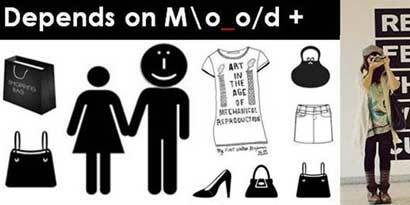 Depends On Mood are a Bangkok based fashion brand for young women who want to look feminine. 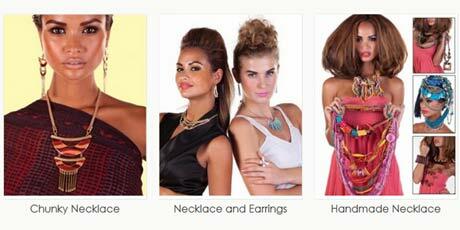 Manufactured in Thailand, this label produces high quality yet affordable fashions. Wow Chic designs and makes fun, funky, fashionable colourful clothing for girls using a variety of vividly printed fabrics. Dressberry specialises in classically styled fashionable ladieswear for the young women. Affordable and fashionable style for every occasion. Amazing printed tops and T-shirts for added street credibility. 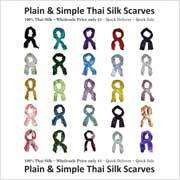 100% made in Thailand from the best cotton fabric, with many chic & funky designs to choose from. Morning Kiss wholesale a versatile range of Korean style fashion & accessories for young women. Lovely cute styles, lovely cute fashion! Fashion jewellery manufacturer and wholesaler based in Bangkok, Thailand. Thousands of amazing, sellable jewellery pieces. Vassalinee manufacture a beautiful top quality range of leather handbags & stylish accessories for the discerning woman. 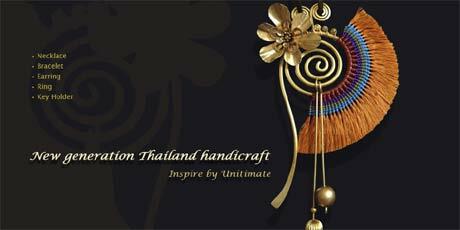 Hand-crafted Thai style jewellery with amazing quality and boho chic. 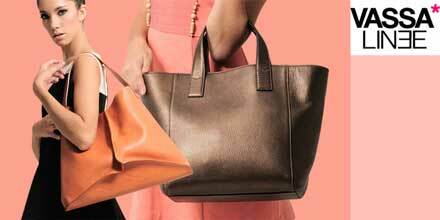 Each item is limited edition and crafted using the best materials. There are 1000's of fashion suppliers in the mall. Here we have compiled a list of all the ones who have a website that is worth looking at in order to give you a clearer idea of the fantastic fashion available from Thailand. We have built strong relationships with several fashion manufactures based here in Bangkok. Thailand has a strong reputation of creating high quality fashions at reasonable prices. If you have designs ready we can make the garments you require, whether it be small or large quantities. 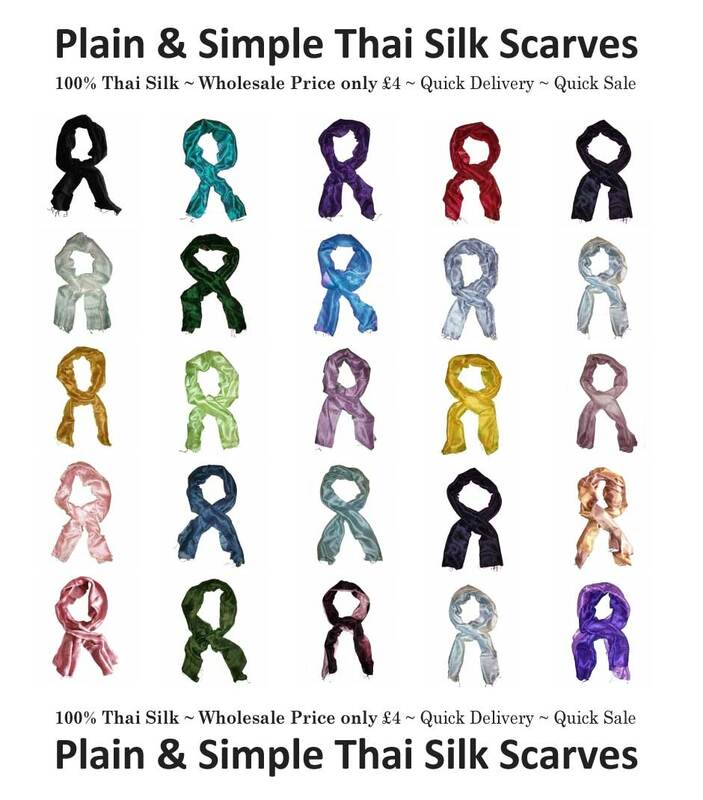 We can also supply quality Thai made fabrics to suit your particular requirements. We are based in Bangkok, which means we can offer you reassurance about attention to detail, quality control, customer service and delivery. Asia Dragon Fashion Connection is quite a new venture and we need quality new suppliers who wish to wholesale fashion clothing to the west. We are currently working on a long term project to identify, catalogue and distribute the best fashion brands which can be obtained at the Platinum Wholesale fashion Mall in Bangkok. Please keep coming back as we will continue to build relationships there and add to our on-line wholesale fashion catalogue. There are 2,300 suppliers there, many of which produce amazing fashions. 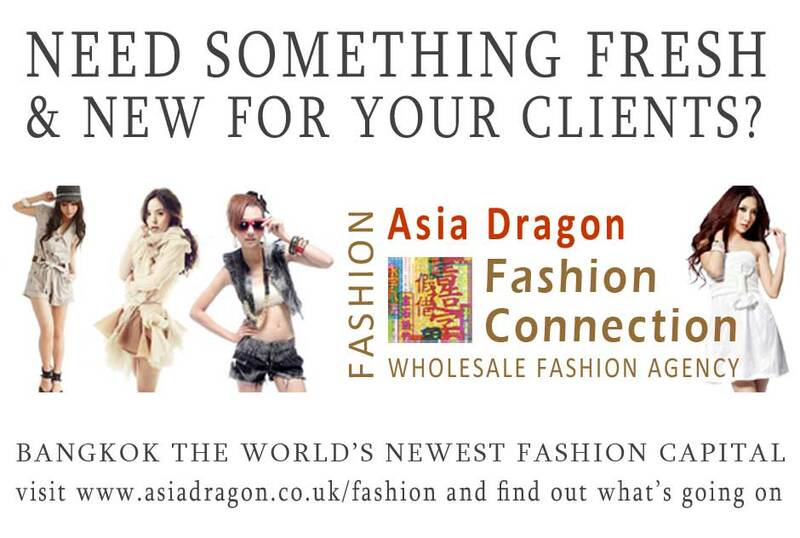 We want to be your partner in Bangkok, Asia's new fashion capital. We understand how difficult it can be for Thai suppliers to get customers from the West. Being based in Bangkok, UK and USA and having both Thai, American and British personnel, we can be your agent and take care of your customers by allowing them to deal through us. We will take down those difficult barriers of trading as we fully understand both cultures. We are on Google+ and Facebook where you can see the latest fashions, news, reviews, videos from the fashion capitol of Asia, Bangkok.